What is Cocotal Punta Cana? 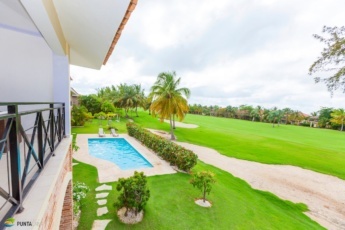 Cocotal Golf & Country Club is a new gated community located in the heart of the tourist area of Punta Cana, Bavaro, in the Dominican Republic. Cocotal Punta Cana residence is near the Punta Cana International Airport, just within half an hour’s reach. In other words, this residence is a privileged area to live. There are golf course, lakes, wonderful houses with their private pools. It is believed that Cocotal Punta Cana is the best area of Bavaro to live, by its facilities, nature, security and, certainly, distance from shopping malls, restaurants and other activities. Therefore that is why this residence is so popular among foreigners. No matter whether they come to the country to live or to have a holiday. And this is quite obvious! After all, Exclusive apartments and spacious villas located in great natural beauty, surrounded by a beautiful golf course.. Moreover, the famous Bavaro beach is just a few minutes’ drive from… As a result, it really sounds like the best tourist area of the Dominican Republic. A good security of the residence will allow you not to worry about the safety of your personal belongings and things of value. And a well groomed and beautiful surroundings of the residence will give a feeling that you are in a tropical paradise. Ultimately, the beautiful beaches of Bávaro are located just 10 minutes by car. Cocotal Punta Cana is famous for its 27-hole golf course designed by Jose “Pepe” Gancedo. He was a Spanish golfer, historic player and designer of golf courses. By the time, most people consider that this golf course is one of the best golf courses in the country. The 27 holes are located among picturesque artificial lakes and tropical plants. The course exceptionally integrates into the Dominican landscape providing unique and interesting challenges in each hole. Just imagine how great and wonderful it is to play golf here. Especially for those who want to take several golf lessons, there is a great opportunity to have professional lessons. The international instructors team of the Sol Meliá Golf Academy and Callaway first class equipment will let you live an incomparable golf experience. As for the game of golf, the Cocotal Punta Cana Club provides all the services and facilities that a golfer from any part of the world could require. Besides the course, balls, carts, there is a Pro-Shop and a restaurant (Privilege Punta Cana). Come round some day to this restaurant to have a dinner. You will appreciate the dishes that the chief serves there. Spanish cuisine, tapas, paella, Seafood Steak Grilled… Delight yourself with these delicacies after a game.